A well defined project prioritization is important for those organizations which have a clear strategy in place that includes – explicitly or implicitly – the project selection criteria. These organizations need to solve the problem of prioritizing the projects they pursue or already have in their portfolio. (D)	Contract management: expected changes, expected claims against us, or towards others. With revenue we mean the revenue of the project over its whole life cycle, from beginning of our activities, usually in project definition phase, until the end of project closure phase. In a similar way, we consider the total project cost over the whole project life cycle. As project profit we define the delta between its revenue and its cost. Every project we undertake contributes to the overall image of our organization, independent of revenue, cost, or profit. Here, we try to estimate the order of magnitude of how much the project could contribute to the organization's image improvement. For example, a new project could obtain reference character if we complete it successfully. Main question we ask here is: how many different areas of expertise do we need to incorporate and coordinate in order to successfully complete the project? Do we have to create project interim or end results which are innovative from the organization's point of view? Do we have to work in a team where team members come from different cultural backgrounds? Are all our internal project team members located in the same compound, or do we have to coordinate project work across different sites of our organization? What would be our organization's image damage in case of project failure, i.e. we cannot deliver the project result as required, and consequently do not get acceptance? After careful risk analysis and comparison with similar, already completed projects, we sum up the risk values of the project in order to obtain an overall project risk value. What contractual relationships govern the project work? Possible relationships cover a range from single supplier, over single supplier with sub-contractors, tri-angular contract (employer – engineer – contractor), to consortium contract. What are expected revenue, cost, and profit of changes, based on experience of similar, already completed projects? What are expected revenue, cost, and profit of claims against us, based on experience of similar, already completed projects? What are expected revenue, cost, and profit of claims towards others, based on experience of similar, already completed projects? For every new project, we estimate each one of these 14 items referring to a preset scale, e.g. 1-2-3-4-5. Thus, we obtain a project-specific prioritization value between 14 and 70. Dividing the interval from 14 to 70 into a certain number of sub-intervals leads to that same number of priority classes. 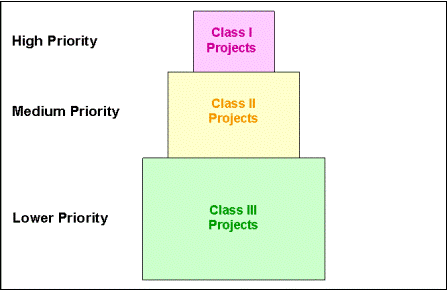 In case we want to differentiate into three prioritization levels we end up with a picture like this. You can adapt this whole prioritization approach to your organization's needs, add or omit items, change the scale into a shorter one, or extend it into a longer one, and adjust the final number of priority classes. We found it best practice to keep the whole system of project prioritization as simple as possible. Thus, effort for communicating and explaining is low, and commitment of all who need to contribute will be much higher. In our table above, each item has the same weight. We suggest to critically examine if this applies to your organizational context and the type of projects you are pursuing. In our sub-section Free Project Management Tools, we offer a simplified project prioritization template you can download and adapt to your organization's requirements. So, we have 72 projects with priority III, 19 projects with priority II, and 9 projects with priority I. These different levels of priorities reflect the different levels of importance of those projects for our organization. Consequently, we will assign the management of those projects to project managers of corresponding levels of skills and experience. Our project management career model must fit that project prioritization result: we need 9 senior project managers, 19 project managers, and 72 junior project managers. In case the organization changes its strategy we need to change the corresponding prioritization criteria accordingly. In general, we do not re-prioritize those projects that are already in implementation phase since this would seriously disturb their execution unless the change of strategy is a fundamental one (like out-carving a significant part of the organization, merging one of the divisions with another internal or external one, etc.). However, we have to clearly communicate changes of our strategy that implicate changes of our project prioritization to all members of the organization. Only then, all affected project management teams and staff members have a fair chance to understand the change and its consequences. It would be anyway best practice to incorporate the organization's staff into strategy development (cf. the white paper on How to Find the Right Projects). In some of the project health checks we do, we find a very questionable – if not to say bad – project status especially in terms of project profit. Project managers and their teams explain there was / is no choice but to do that project on a very high priority level because it was declared being a strategic project for the company. In most such cases the project has to be done because it could secure market entry in a certain country or region. We consider the entry into a new market a project itself. Any project that helps us to enter a certain market, thus, becomes part of the larger project "Entry in New Market X".